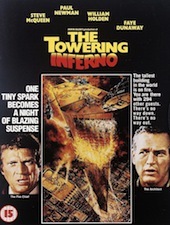 The Towering Inferno isn’t exactly a complicated movie. The premise here is pretty simple: A gigantic building catches fire. People are trapped, and the fire department has to come put it out. Sure there are other storylines going on, and an ensemble of interesting characters to follow, but these periphery elements are really just there to advance the story about the fire and ratchet up the tension even more. 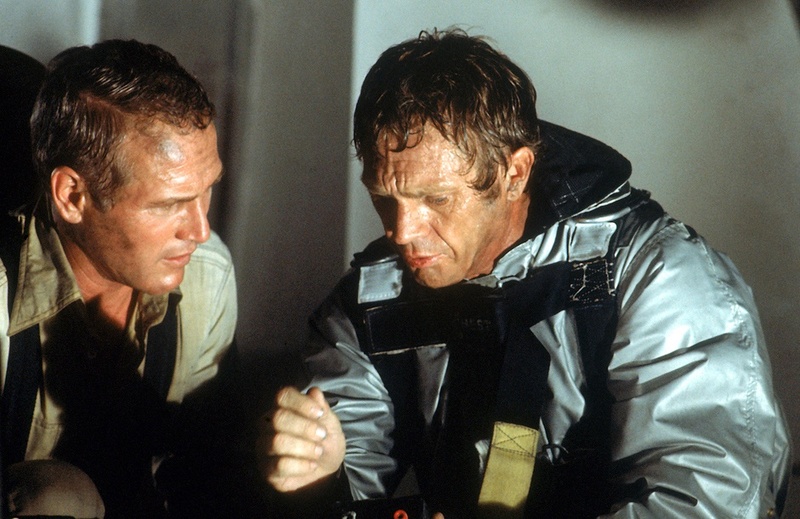 The Towering Inferno is a big-budget disaster flick in the grandest tradition of the genre, starring some of the biggest names in movie history, and for the most part it gets everything right. From the start we are introduced to Paul Newman, an architect who has just finished putting up San Francisco’s newest skyscraper: a 130-story tall behemoth that makes all other skyscrapers seem like LEGO projects. There’s a big party right near the top floor where all the most important people in town have shown up for a gala event in order to commemorate the opening of the structure. And on the bottom floor an electrical engineer is worried about the potential for fires due to low-quality wiring and other cost-cutting measures. Gee, I wonder what will happen. Sure enough a fire breaks out, and it’s up to our hero to save everyone. Well, along with a little bit of help from the fire department and Chief O’Hallorhan, played by Steve McQueen. 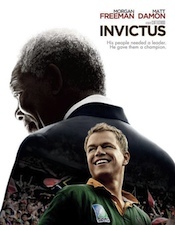 Several decades ago, movie stars didn’t get any bigger than Paul Newman or Steve McQueen. But just like Robert DeNiro and Al Pacino in their heydays, these two stars rarely shared screen time together. So putting them in the same movie was virtually guaranteed to produce a hit, not to mention tossing other names in for good measure like Faye Dunaway and Fred Astaire. It all adds up to a tension-filled action movie that starts off a little slow but once it gets going, never lets up clear through it two-and-a-half hour run time. 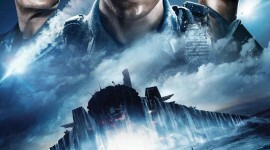 "And then I'll launch myself over the building on a motorcycle..."
Audiences today have grown accustomed to big-budget disaster flicks and massive destruction scenes like those in the spectacularly overblown epic 2012. And that’s not necessarily a bad thing, as modern visual effects wizardry can put us right in the middle of the path of destruction like never before (not to mention the 3D technologies that are becoming increasingly common in movies). But part of the appeal of The Towering Inferno is seeing the building catch fire, watching massive sets being destroyed right before our eyes, and knowing that the flames are real even if the walls and windows are fake. If this movie were made today, we would be subjected to all sorts of zooms and pans through CGI fire while actors were safely prancing around in front of green screens. Newman and McQueen even did many of their own stunts, including some rather dangerous ones near the end during the final last-ditch effort to quench the blaze. Several bits of the plot are so contrived it’s practically groan-worthy, such as the introduction of a deaf character who doesn’t know the fire alarms are blazing, the mere existence of the cocky son-in-law of the building owner who instructed the construction workers to cut corners, and even (yes they actually went there) a kitty cat who needs rescuing. But the real star of the show is the enormous blaze and the sheer futility of all the efforts of the firemen to stop it. A couple different schemes are attempted in order to rescue the party guests, and some of them fail spectacularly and even a little unexpectedly. Even though the end is never really in doubt, it’s a fun ride and a fantastic disaster movie that could easily hold its own against anything Hollywood has to offer today. Your review has made me want to see this movie. Congratulations.